I've always been a fan of Barbie. 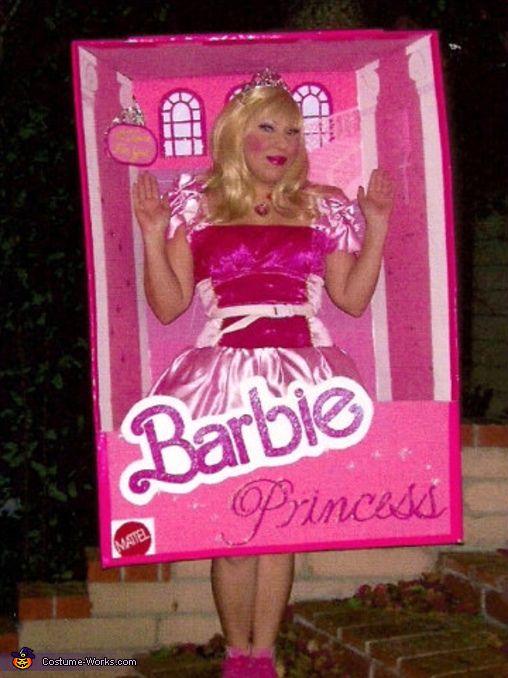 I saw the Barbie in a box costume before and wanted to make it even better. So my idea was to make the box bigger. I used a wardrobe box I got from u-haul for about $13. I planned on putting accessories in the box so I needed to make the box wide enough for people to be able to see them. I painted the entire box white to cover the pictures on the box. Then I hand painted the pictures on the box free-hand (I've always been an artist so I draw pretty good). I did get ideas from various Barbie boxes to make it look as realistic as possible. Then I added my accessories. I got a cheap tiara to put inside the box as the "tiara for you". Then I needed to put straps in the box to be able to walk around in it hands-free. I cut 4 slits in the back for shoulder straps and 2 on the bottom for my waist. I used white belting for the straps and attached parachute clips to make it easy to put on and off. I made the straps a little too high at first and had to make last minute adjustments so my head wouldn't hit the top of the box. For my outfit I wore a wig and blue contacts to look Barbie enough because I look nothing close to her. I couldn't find barbie enough dress that fit me so i just made one.